Baseball is as much about tradition as it is about hitting home runs. For me, one of the great pastimes of baseball is calling the game. I find that I prefer radio broadcasters over their television counterparts. Maybe it’s the nostalgic part of me envisioning my grandfather listening to games over a crackling radio or maybe I just appreciate their artistry more. It’s about their voice. It’s about their cadence and inflection. It’s about the nuances they share and the banter they exchange over the sounds of the ballpark. Charlie and Dave are like old friends. I invite them into my living room every night throughout the summer, letting them deftly paint the picture of the game as smoothly as Bob Ross used to add a few happy trees or bushes to his canvas. My experience following the Nationals is richer thanks to them and I wanted to let them know that. 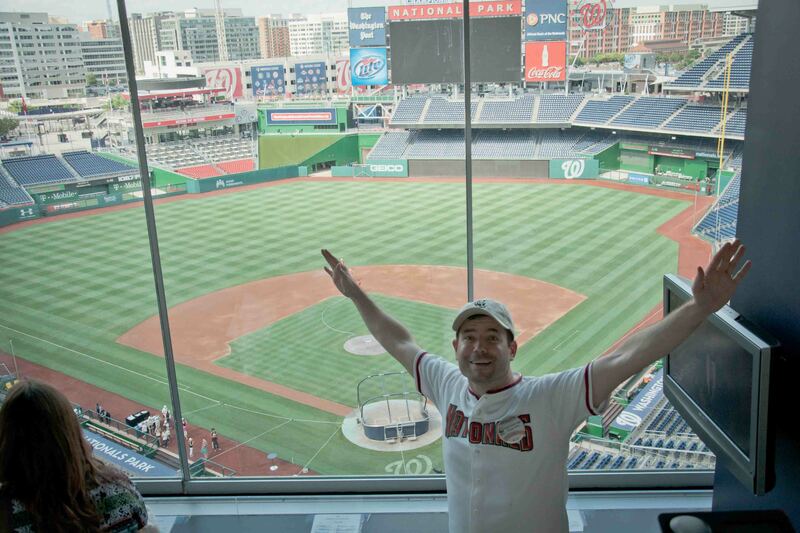 I’m a loyal Nationals fan – while I’ve never been able to be a season ticket holder, I’ve found a way to be at every Opening Day since the team came back in 2005. I also don’t have cable so I don’t get MASN, so I listen to you on the radio. And truth be known, I often mute the TV when the games are on WUSA9, and overlay you guys on WJFK. I sent Charlie and Dave this photo of me taken in the broadcasting booth last summer. What a dream job it would be to work along side them. I’ve made a commitment to send a handwritten letter to someone every day this year – you’re day 175. It would be great to hear back from you or even better have the opportunity to visit you guys some time. 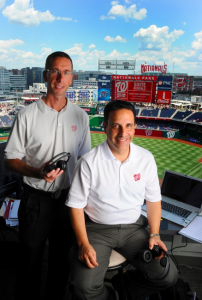 You are truly the best baseball broadcasting team in the business bar none and it is a pleasure to see the game through your words. P.S. 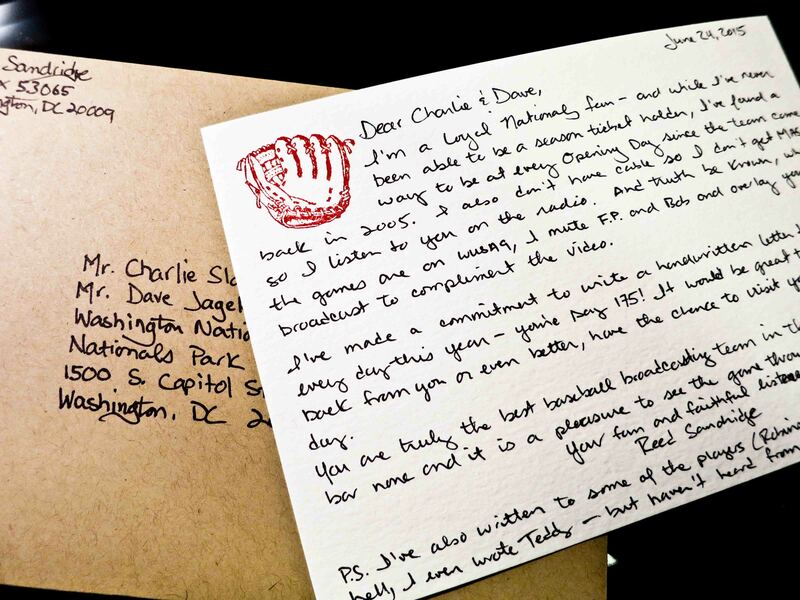 I’ve also written to some of the players (Robinson, Escobar, Werth)…hell, I even wrote Teddy – but haven’t heard from a soul. 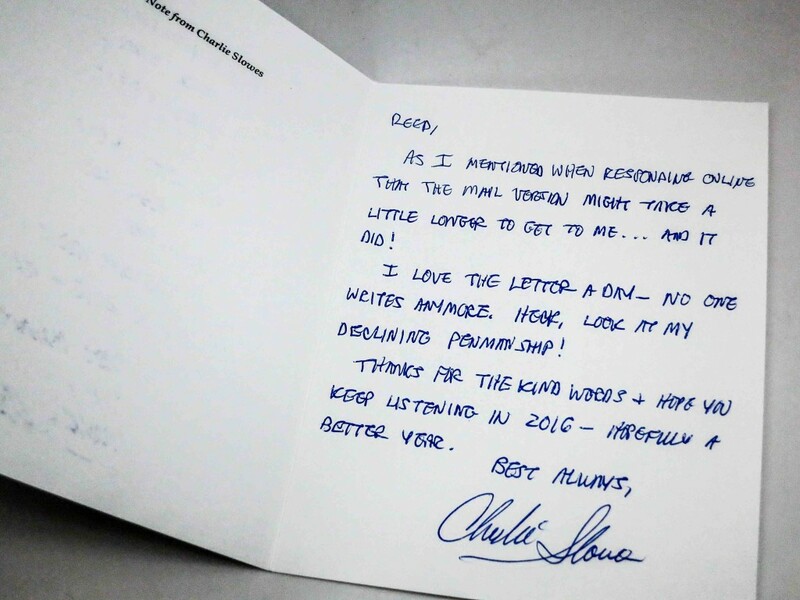 Today I received a card in the mail from Charlie! 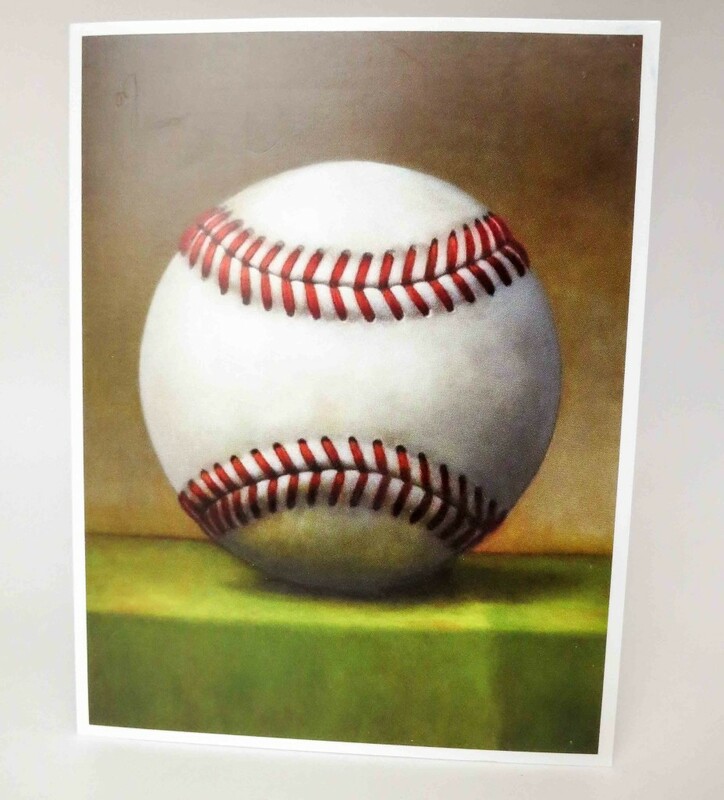 The front of the card is an image of “Big Baseball”, a painting by Washington, D.C. artist Daniel Kessler. This entry was posted in Just because and tagged baseball, broadcasters, Charlie Slowes, Dave Jageler, embossed, fans, handwritten letters, Paper Source, pastimes, radio, sports, Washington Nationals, WJFK, Year of Letters. Bookmark the permalink.